Clark Cooper’s ER Series are rotary valves offered in a range of pipe sizes from ½” to 6” NPT. The ER series offers a distinct advantage for corrosive fluids because the materials for all wetted parts can be tailored for the specific application. It includes a diverse line up of materials including Naval Bronze, Hastelloy and Monel, as well as more common materials like Stainless Steel and Commercial Bronze. 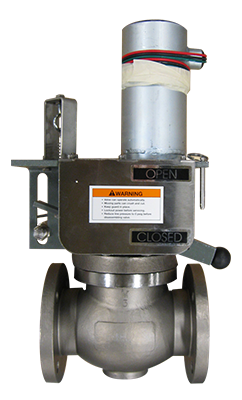 The ER series requires no minimum differential pressure for opening, and can handle fluid temperatures up to 550° F. These rotary valves are extremely durable due to their robust design and are often used for dirty, viscous, and extremely corrosive fluids. The ER valves (up to 3") are nationally CRN certified for all Canadian provinces. Additionally, the ER series is available in 2-way valves and 3-way diverting valves. * Not all combinations are possible. Please consult Clark Cooper before ordering.